Expertly helping you rediscover your perfect smile. When cavities form due to tooth decay, they can be swiftly corrected with dental fillings. At Carol Stream & Elgin Dental Associates, we are very conscious of not only your oral health but also your overall wellbeing. Therefore, we offer tooth-colored composite fillings that are free of metal or mercury. What’s more is these fillings match the shade of your natural teeth and thus blend into your smile. Composite fillings are non-invasive, require less drilling, and can be completed with very little discomfort. Your caring dentist simply numbs the area around the tooth and then cleans away any plaque or decay. Next, we place the composite resin and mold it around the shape of your natural tooth. The resin fills the cavity, is shaped to fit your bite, and actually bonds to your tooth (unlike silver fillings). Once complete, your restorative dentist checks your bite and provides any additional advice. The end result is a restored smile boasting a very discreet yet long-lasting restoration. Dental crowns can be used to not only protect a tooth but also to replace a missing tooth. This is done using a dental bridge, which consists of two crowns either side of an artificial tooth. The bridge is custom-made at our partner lab based upon impressions taken at our office. It is made using a strong, natural-looking material that is completely metal-free. Bridges are required when one of your teeth is missing. When this occurs, we take an impression of your teeth, discuss your preferences, and send this off to our partner dental lab. Once returned, the newly created bridge is placed. At the start of this process, your dentist prepares the two neighboring teeth and then places the crowns over these teeth. The crowns act as an anchor to hold your new tooth into place and thus give you back your complete smile. This restoration has many health benefits as it stops potential problems such as teeth shifting, increased plaque buildup, and pain when chewing. Dental bridges are very durable and will be assessed during your regular check-ups and exams. Missing multiple teeth or even all your teeth can have a detrimental impact on your smile. Not only does it affect the aesthetics of your smile but it can also lead to dental problems such as teeth shifting, bone deterioration, and further tooth loss. 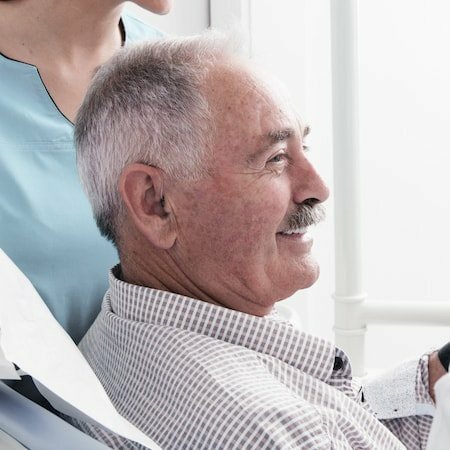 The good news is our dentists in Carol Stream and Elgin, IL provides a range of denture options to help repair your smile. Whether you only have a few missing teeth or need a new set, we have the right option for you. All of the dentures have a natural look and use the highest-quality materials. Our team works closely with our partner dental lab to give you the best options and fit possible! Partial Dentures (when only a few teeth a missing): These removable dentures use clips or clasps to stay in place and are designed to match your natural teeth. They can be worn either during a transitional stage before implants or more permanently as tooth replacements. Full Dentures (all teeth missing): Conventional removable dentures are fabricated to conform to your mouth and comfortably fit your smile. Carefully crafted at our dental lab, these dentures look and function like your natural teeth. Implant-Support Dentures (all teeth missing): Placed upon dental implants, the denture provides a more stable, permanent fit. This prevents the denture from moving and mimics the natural feel of your smile. 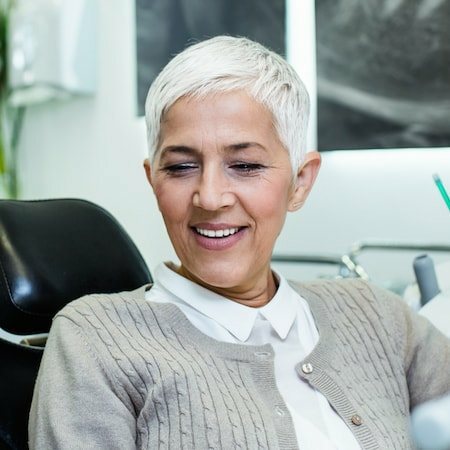 The implants act as a support, while the dentures are securely attached for lasting comfort and function. Each of these dentures is created using impressions of your mouth. These are sent to our dental lab for creation and are then fitted in-house by our experienced restorative dentists. We’ll ensure the fit is comfortable and provide you with clear instructions about your chosen denture option. When your tooth has severely decayed, or part of it has broken off then an inlay or onlay may be the best form of treatment. Inlays and onlays are custom-made restorations that replace missing parts of your teeth or fill in larger holes that dental fillings cannot. Inlays: When the damage is to the center of the tooth, an inlay can be used to restore it. The inlay is created from impressions taken by your doctor and is bonded to the remaining tooth structure. These restorations are very durable and are made using porcelain, so blend into your smile. Onlays: This conservative treatment helps protect your teeth from fracturing or becoming more severely damaged if the problem affects more than the cusp of your tooth. Our dentist bonds a custom-shaped piece of porcelain over the weakened part of your tooth – this preserves the healthy part of the tooth. At our office, we can create and bond onlays in a single visit using our ED4 CAD/CAM system. Both inlays and onlays can be placed with zero discomfort and are constructed to meet your personal needs. These long-lasting restorations help prevent future dental problems while discreetly repairing your smile. Unfortunately, there are times when the best option is to remove an afflicted tooth. This may be due to severe decay, trauma, or for orthodontic reasons. Our dentists always strive to save your natural tooth, but when an extraction is necessary, you could not be in better hands. Our general dentists skillfully and carefully perform simple extractions. They begin by cleaning and numbing the area, so you don’t feel any discomfort. The tooth is then expertly extracted, and the remaining socket kept clean and healthy. For more complex extractions that may require implants or bone grafting, we draft in our expert oral surgeons. 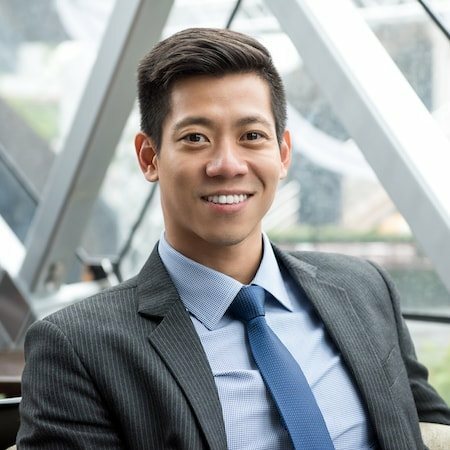 Our offices have board-certified oral surgeons who use the latest techniques to make your experience as comfortable as possible. They also provide post-treatment advice and review your restoration options. "This office has outstanding service! The staff treats every patient with respect and goes out of their way to make sure your needs are being met. Compared to other offices I think this place is wonderful. I would highly recommend this location!" E4D restorations in Carol Stream and Elgin, IL. On occasion, our teeth can become compromised and require protection or a custom-made restoration. It may be that your tooth has cracked, chipped, or fractured and is jeopardizing your oral health. When this happens, our skilled team may recommend a dental crown to strengthen the weakened tooth. A dental crown (similar to a cap) is a tooth-shaped covering that can be placed over a damaged, decayed, or unsightly tooth. 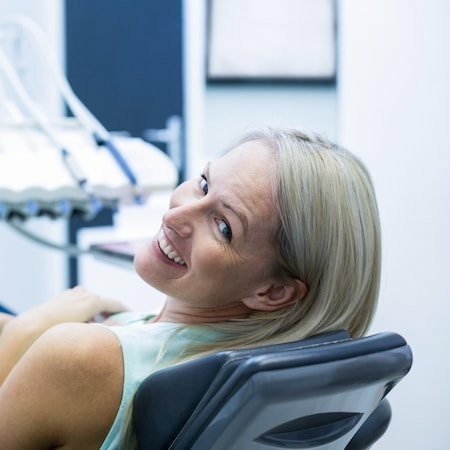 Our high-tech dental offices can not only restore your smile with a beautiful, natural-looking dental crown, but this process can be completed in one visit! 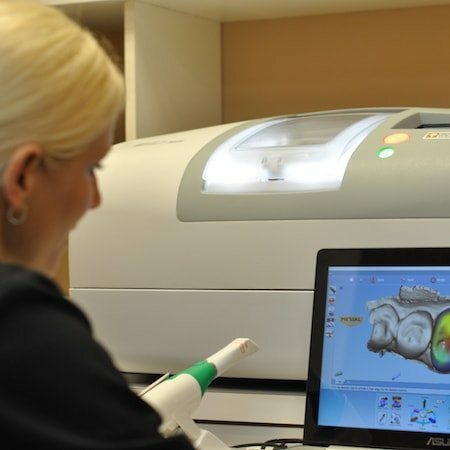 Using E4D CAD/CAM technology, our expert dentists take digital impressions of your smile and use this 3D software to design your new crown, in our office. The design data is then sent to the milling machine for creation. No temporaries, no repeat appointments, no referrals. You can have your new crown designed and fitted during one appointment, and walk out with a new smile. Each of our crowns is custom-made to fit your individual needs. Placing the crowns requires our dentist to check the fit, shape, and size. Once perfect, we bond the crown into place for a durable and fully functional restoration. Replace your missing tooth with our skilled restorative dentists in Elgin and Carol Stream IL. Dental implants are the ideal choice to replace one or multiple missing teeth. Made up of three components, dental implants mimic your natural tooth root for a more permanent and stable restoration. The implant post is placed into your jawbone for a solid foundation. Once it blends with the bone, we add the abutment, which acts as an attachment for your final restoration (crowns, dentures, etc.). Our experienced surgeons place implants in both Carol Stream and Elgin, IL. We strongly believe that implant success rates greatly increase when excellent, experienced surgeons are involved in the treatment. Our team makes your visit more comfortable and the outcome more predictable due to their advanced training and level of technical prowess.